Over the weekend, thanks to the winter weather, 33 electric poles fell in the county. State Route 41 remained closed at the U.S. Route 35 bypass near Washington Court House as crews worked to replace the poles lost in the storm. Following a weekend of frigid temperatures, Fayette County will have a slight warm-up today before temperatures take another plunge. According to weather.com, Wednesday will be the first day the county will see temperatures above 40 degrees since the deep freeze that continues to plague snowplow drivers. This rise in temperature will be accompanied by a 100 percent chance for precipitation, which will begin as rainfall with an accumulation of around half an inch. As the evening settles, it’s predicted rain will become snow, and skies will remain overcast late. Winds will blow throughout the day at speeds upwards of 20 miles per hour. Within the City of Washington Court House, some streets have been closed the past couple of days due to ice/snow buildup, which have caused some traffic accidents. Also according to weather.com, on Thursday morning the county will be under freezing at about 30 degrees with winds around 20 miles per hour throughout the day. Cloudy skies early will become partly cloudy later at night with only a 10 percent chance of precipitation. The low temperature will be about 9 degrees. Friday is currently forecasted as mostly sunny with a high temperature for the day at 17 degrees and the low at 16 degrees. There is a low chance for precipitation in the evening at about 10 percent, and winds will blow around 10 miles per hour throughout the day. On Saturday, the temperature is predicted to climb to 28 degrees during the day before becoming partly cloudy later. Snow showers are expected before midnight with a chance of snow around 40 percent. Winds will blow all day at low speeds up to 10 miles per hour. Sunday is expected currently to be warmer with a high temperature of 32 degrees and a low of 23 degrees. No precipitation is currently in the forecast for Sunday. Additionally, local school districts reacted to the condition of the roadways and the general low temperatures Tuesday. Miami Trace Local Schools were on a two-hour delay while Washington Court House City Schools took a day off of school. As of about noon on Tuesday, Fayette County was also no longer under any winter weather emergency level, warning or watch. Following this week, Monday, Jan. 28 is looking to be another warmer day with a high temperature of 37 degrees. The low temperature though of 20 degrees will bring with it snow showers developing after midnight into Tuesday, Jan. 29, according to weather.com. Following the snow on Tuesday with a low temperature of 4 degrees in the evening — and besides Wednesday and Thursday, Jan. 30 and 31 — snow is forecasted through Feb. 5. Stay with the Record-Herald for more coverage of potential winter weather in Fayette County. 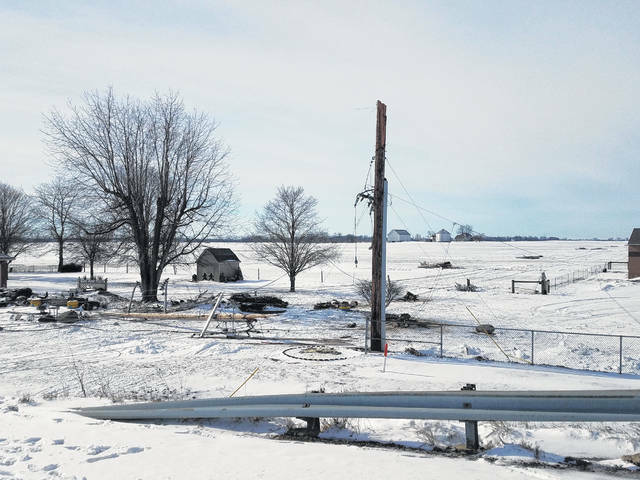 https://www.recordherald.com/wp-content/uploads/sites/27/2019/01/web1_20190122_122534.jpgOver the weekend, thanks to the winter weather, 33 electric poles fell in the county. State Route 41 remained closed at the U.S. Route 35 bypass near Washington Court House as crews worked to replace the poles lost in the storm.